God points this out to us in Isaiah 55. That my first reaction to a situation may not be how God wants me to react? That my first solution to a problem may not be the wise one God would like me to choose? That the lens which I view the world needs to be adjusted according to God’s word? Isaiah says ‘yes’ to all of those questions. God sees the world and our lives so much differently than we do. As we read and meditate on God’s word, he gradually changes our thinking, one scripture at a time. 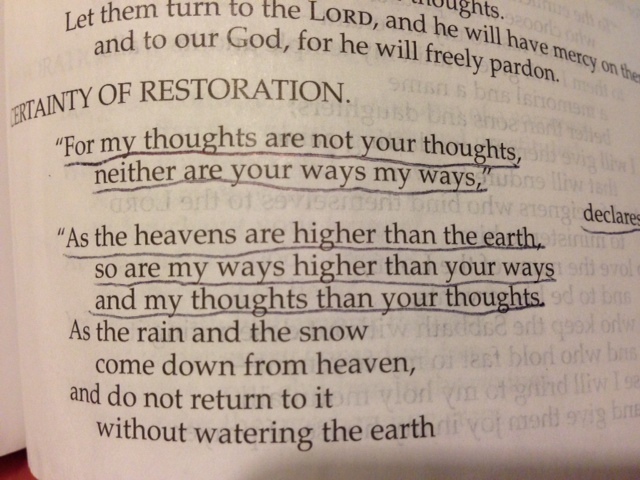 As we hear and obey his directions, he changes our behavior, one day at a time. That’s what this journey towards the Truth is all about. Dear Father, we thank you for your awesome word to us. We ask that you continue to transform our thoughts and our behaviors as we experience your truth on our journey towards you. We love you! You are our final destination. Thank you for the certainty we have about how this journey ends because of what your son, Jesus, did for us on the cross. In his redeeming name we pray, Amen.